The MGI Solution Explorer helps developers group, access and build related projects. This is valuable in large application development where you have used Packed Project Libraries or other techniques to split up your solution. The time saved by splitting up the build can easily be lost in a cumbersome build process. With the MGI Solution Explorer, the build process is captured as data, so it’s easy for anyone on the development team to quickly and correctly perform a build. A basic solution will just be a list of projects. Add a project to the solution by dragging the LabVIEW Project file into the Solution Explorer window. Add as many projects as needed to the solution. Drag and drop the projects to re-order them in the solution. Double click on a project to open it in the LabVIEW development environment. Now all developers have a place to easily access all of the related LabVIEW Projects. When it’s time to build, Just selected ‘Build -> Build Solution (Release)’. The projects will be built in the order they appear in the solution. If the source code of a project hasn’t changed, the project wont be built. That’s it! The MGI Solution Explorer is an extensible tool for performing or skipping a series of actions called solution items. In the basic solution above all of the items were LabVIEW Project builds, but other types of items are built in, and you can create your own custom items. Need to execute a VI in between building two projects? No problem, add a new item to the solution. Need to execute a operating system command? Again, easy! Just add a new item to the solution. As explained above, the most basic solution item is a LabVIEW project, but there are four other solution items included in the default MGI Solution Explorer installation. Click the plus arrow in the solution explorer window to add new solution items. Code Signer - Digitally Signs code. This expands LabVIEW’s ability to sign code to include signing of Packed Project Libraries. LabVIEW Project - Builds LabVIEW build specifications. Run VI- Executes a VI. Self Extracting Zip - Builds a self extracting zip file. This allows developers to distribute installers and applications in single, easy to use files. See the Self Extracting Zip Files for more information. Shell Command - Executes a shell command. Sub-Solution - A solution can contain another solution. When the top level solution is built, the sub solution will also be built. 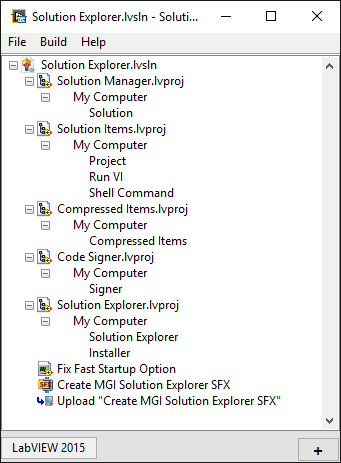 The MGI Solution Explorer is designed using packed project libraries and a plug in architecture. This means that if you need a solution to perform a custom task (like upload to your company’s FTP for example) it’s possible! All you just need to do is write the plugin, then add the item to your solution. (note: Our library is currently being migrated to Bitbucket. When complete, we’ll provide a link to all the source code. Stay tuned.) The MGI Solution Explorer is an open source tool that we’ve developed at MGI. This means that we want your input (both code and ideas). All of the source code is hosted on the MGI Library Bitbucket. So if you find a bug, you can fix it and push it back up to us, so the community can benefit from it. If you’re not into fixing the code yourself, feel free to create an issue in the issue tracker and we’ll see about fixing it for you. The Solution Explorer is built…. using Solution Explorer. So when you get the code use the solution to navigate all of the related projects.